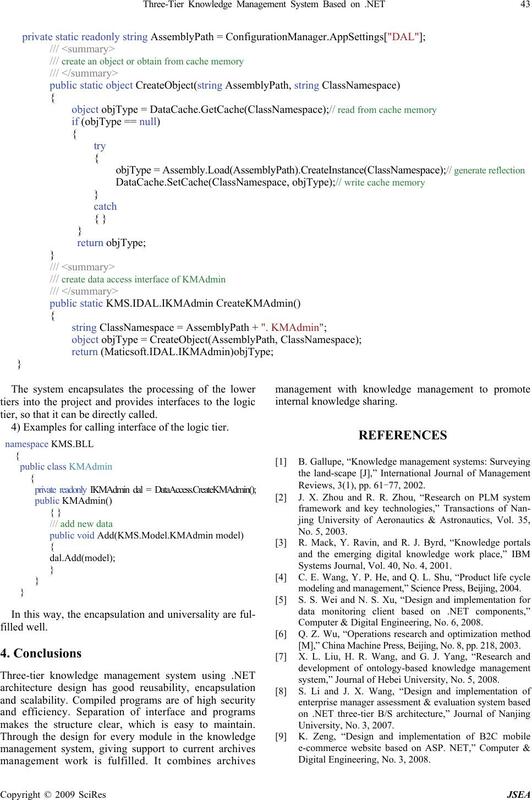 Received January 19th, 2009; revised February 20th, 2009; accepted March 24th, 2009.
and optimize the enterprise’s knowledge resources . once the business requirements are changed. and guaranteeing good performance for the system. tabase to ensure good encapsulation and maintainability . to recompile the whole system. tional modules are briefly illustrated as follows. 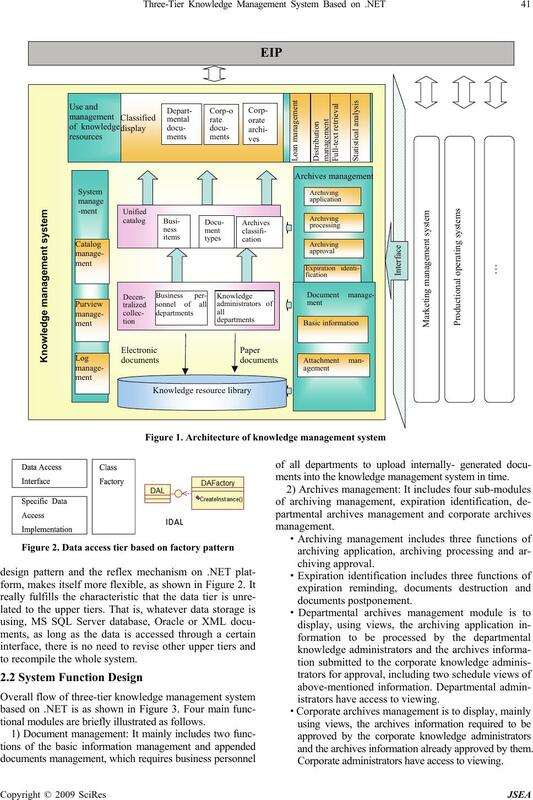 ments into the knowledge management system in time. istrators have access to viewing. and the archives information already approved by them. Corporate administrators have access to viewing. KMS. BLL. 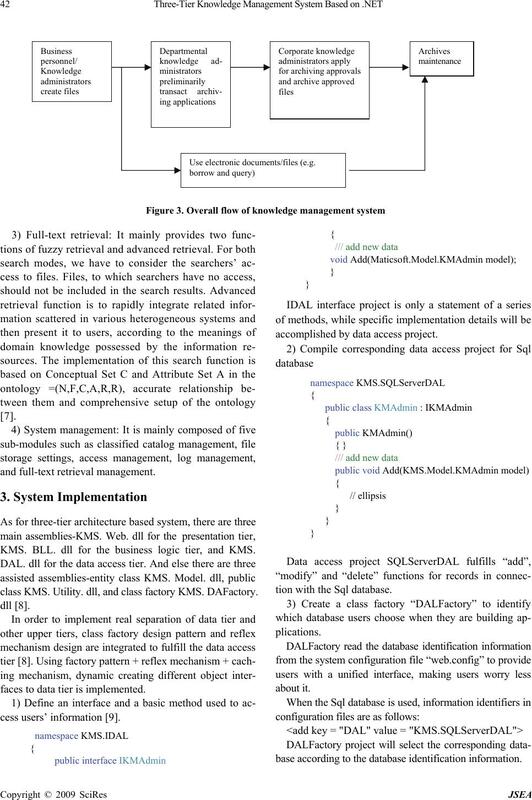 dll for the business logic tier, and KMS. class KMS. Utility. dll, and class factory KMS. DAFactory. faces to data tier is implemented. accomplished by data access project. tion with the Sql database. base according to the database identification information. tier, so that it can be directly called. 4) Examples for calling interface of the logic tier. makes the structure clear, which is easy to maintain. Reviews, 3(1), pp. 61-77, 2002. Systems Journal, Vol. 40, No. 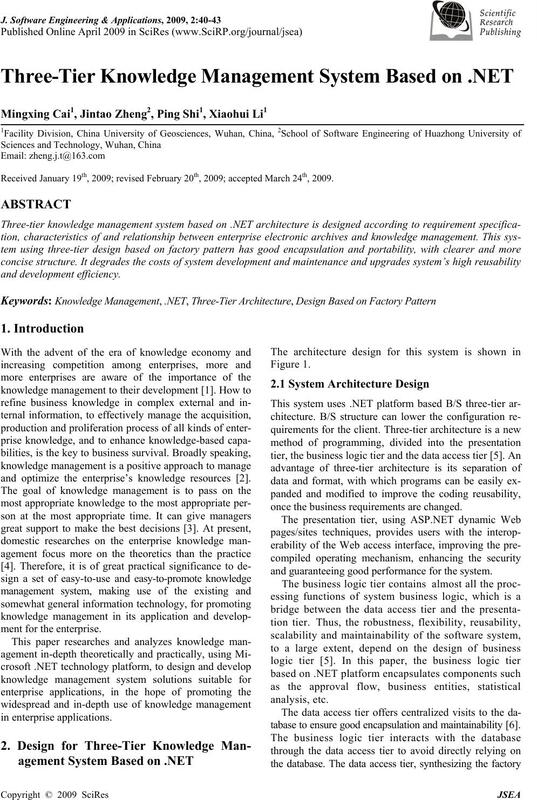 4, 2001.
modeling and management,” Science Press, Beijing, 2004. Computer & Digital Engineering, No. 6, 2008. [M],” China Machine Press, Beijing, No. 8, pp. 218, 2003.
system,” Journal of Hebei University, No. 5, 2008. Digital Engineering, No. 3, 2008.